I’ve mentioned before that there are three topics I’m unable to keep quiet about (fiber consumption, yoga, and birth control); if you know me well, you know how I feel about all three (in a word: strongly). Birth control is one topic I’m zealous about, and it’s probably not for the reason you think. Simply—and I have no problem expounding on this, but I’ll stay brief here—the reason I’m so passionate about birth control and the medical methods available for it, is that I want babies to be wanted. Beyond my broad view on birth control as whole, regarding methods, I’m committed to preaching the wonders of the IUD—Intrauterine Device. If you’re unfamiliar, know that the name quite literally explains what it is. For a number of reasons, I happily insert myself into any IUD conversation happening around me (which you may not think occurs very often, but I spend a bit of my time in OB/GYN offices), recommend my approach to anyone who’ll listen, and practically do the IUD sales reps’ jobs for them. Staring at this exhibition, I was spellbound. The poster is a display of elementary, advancing, and somewhat horrific IUDs of old, new, and just-a-bit-ago. I stared at the poster, read the caption, and discussed the items with the staff—all of whom had a favorite. When the doc emerged from his consult, he was more than happy to point out a few of his favorites and discuss the evolution of this, my preferred method of pregnancy prevention. It was a stimulating conversation that ended in a joke about IUDs as Christmas ornaments—only, only in an OB's office would that happen. 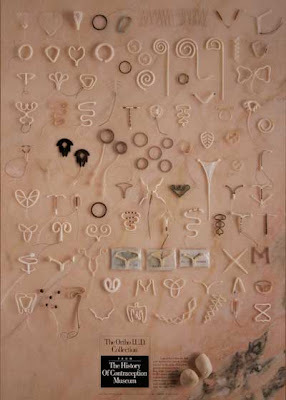 I was so enthralled by the poster that I thought you too would enjoy this peek at Ortho-McNeil’s depiction of the evolution of the Intrauterine Device. See those small stones near the caption at the bottom? Well they’re not a part of the parade for looks only, they’re included as a visual aid of what nomads as birth control for their camels while on long desert journeys—small stones wedged into the cervix. Some of those things look scary! You talked me into the modern one, but I don't think you could have convinced me of the stones. How do you think they got the stones out, may I ask?? Desperate times call for desperate measures. I wanna go on the field trip! you crack me up and I too would like to spend a day inside your brain... I am glad now that I know what kind of drugs sell.... Thats fun. I am an IUD girl and I can now tell myself again why I was born when I was... I would be intrested to know where that meusum (yes I know I spelt that one wrong) is. You guys were so sweet and accomodating... I can't even believe that Walter, well you know. I am so sorry. Thank you for letting us stay. We always enjoy your company.